A Rotherham-based entrepreneur has taken the lead of her self employment career and established Bow Wow Brigade, a unique pet care and dog-walking business. 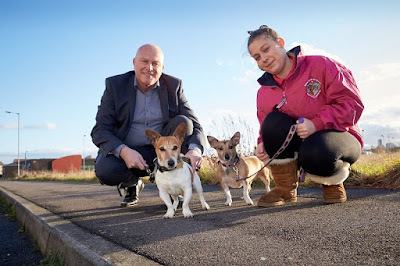 Casey Rush offers dog walking services, holiday help and puppy training classes, and has secured a £1,000 grant from the UK Steel Enterprise (UKSE) Kickstart Fund. The funding has been used to purchase basic equipment such as cages and leads, whilst also investing in marketing collateral to help establish an initial customer base. Alongside this, the UKSE grant helped to assist Casey's completion of a Level 3 Canine Behaviour course, making her one of the very few qualified dog walkers in the area. With plans to continue her training, Casey's long-term goal is to start teaching dog first aid courses and to expand her solo venture to a team of ten within five years. Currently offering services within a 5-mile radius of Wath-upon-Dearne, Casey hopes to expand the business across South Yorkshire. Bow Wow Brigade already has a growing social media presence and has established successful relationships with local dog grooming salons. Casey Rush, founder of Bow Wow Brigade, said: "As an animal lover, it's been a dream of mine to set up a pet care business and the funding from UKSE has been fundamental to my success so far. "There are a number of similar businesses in the area but I'm confident that my qualifications and variety of services will help me to stand out. As well as dog walking, I also offer Critter Cover for smaller animals and would love to do a small animal care course in the future." UK Steel Enterprise, a subsidiary of Tata Steel, was launched in 1975 to support the economic development of steel industry areas. Launched in February 2016 by UKSE, with support from RIDO and Rotherham Youth Enterprise RYE), the Kickstart Fund supports people looking to establish a business in the local area. Allan Wood from UK Steel Enterprise, said: "It's clear that Casey is very passionate about animal welfare and it's great to hear about her ambitious plans for the future. "The Kickstart programme was designed to support the establishment of new business ventures like Bow Wow Brigade. It's promising that, as well as acquiring basic equipment, the funding has also allowed Casey to achieve qualifications that I imagine will only increase confidence in her services and reputation in the area."